string art，Bézier curves are also formed by many common forms of string art, where strings are looped across a frame of nails. ^ Shene, C.K. 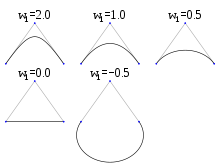 Finding a Point on a Bézier Curve: De Casteljau's Algorithm. [6 September 2012]. Donald Knuth: Metafont: the Program, Addison-Wesley 1986, pp. 123-131. Excellent discussion of implementation details; available for free as part of the TeX distribution.